Bananas and pound cake and rum and fire: What’s not to like? 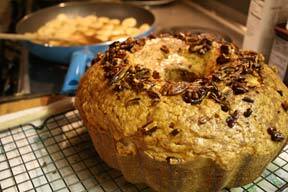 Anyways, the recipe also included all the fun stuff like separating eggs, using the Bundt pan, drizzling rum sauce…. AND setting the banana & rum & sugar mixture on fire. Or so we thought. But, it didn’t all go down like we had hoped — we even had the fire extinguisher on the counter, just in case. (I don’t think my roommates would have liked to wake up to a burning apartment.) But our fire didn’t amount to much. Or anything actually. Just a tiny blue flame that lasted approximately five seconds. We even tried heating up a tiny bit more rum, but no luck. Maybe next time we’ll get some good flames? Because with a sauce this good, there will be a next time, even if it’s just with some vanilla ice cream. The cake, too ,was delicious. (Though for now, it was hidden by the sauce.) I think it’ll be another one of those cakes that’s even better the second day. Good news for Tuesday evening with my friends!